Joe Pico, known to friends as “Coach Pico,” quietly passed away in his home on Tuesday, January 29, 2019 at the age of 84. Joe will be lovingly remembered by his dear wife, Shirley, of 63 years, and his children, Les (Rita), Jeff (Darleen), Brad (Christy), Julie (Joe), Robert (Farrine), and Lisa. Joe will also be fondly remembered by his 24 grandchildren and 28 great-grandchildren. Additionally, Joe is survived by LaReece Morris (sister-in-law), Delores Ramos (sister), and Rudy Ramos (brother-in-law). Joe was predeceased by his sister, Mendora Pico. Joe was born in El Paso, Texas in 1934. He was primarily raised in Los Angeles, California. Joe served in the armed forces (Korean War Conflict), graduated from ASU, and received his Master’s Degree from ASU. Joe was also a letterman on the Sun Devil Football Team. In the early 60’s Joe was awarded the “Cecil Abono Outstanding Captain Award” back to back (1962 and 1963). This award has never been given back to back since this occasion. Joe was recognized for his outstanding offensive line play and team leadership skills. 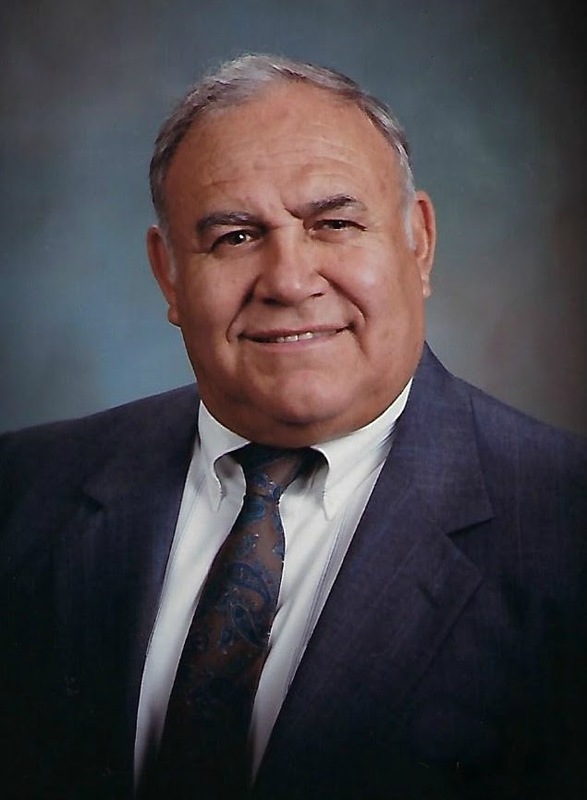 Joe taught Psychology, Physical Education, Drivers Education, and coached football and wrestling for many years (Prescott Unified School District, Mesa Unified School District, and Gilbert Unified School District). He had a profound impact on many youths. After his coaching stint was complete, Joe entered high school district administration. He became a successful Athletic Director for many years. Because of his integrity and dedication to his work, he was admired and loved by many. Joe also served faithfully in The Church of Jesus Christ of Latter-day Saints. There he worked with youth groups and assisted in many fundraisers for the youth organization. All the way until his dying days, one could find Joe in the service of his fellow men. All are welcome to attend a viewing on Thursday, February 7, 2019 from 6:00 to 8:00pm at Bunker’s Garden Chapel, 33 North Centennial Way, Mesa, Arizona 85201. Funeral Services will be held on Friday, February 8, 2019 at 10:00am at the Stake Center located at 2228 East Brown Road, Mesa, Arizona 85213. I truly believe that without the discipline and integrity Coach Pico instilled in me while I played on his football team at Westwood High School, I would never had made it through Basic Training in the U.S. Army, serving for 15 years, and be where I am today and who I am today. He was someone you could truly look up to and endeavor to be like. Thank You, Sir, for instilling these traits in me! So sorry for your loss Pico Family. May you be comforted in the knowledge that you will see him again. Rest in Peace Coach. What a fun man Coach Pico was. He teased me mercilessly in Psychology class. Best class of my Westwood High School days. Always so fun to run into him around town. We will all miss his friendly smile wit and charm. Joe was my coach and psychology teacher at Westwood and taught Diane to drive at Westwood. Years later, he became our neighbor. We always looked up to him and appreciated his guidance, leadership and in later years, his neighborly friendship. There’s just not many people you meet in life that you remember as fondly as someone like Joe. He was truly a good man, and those like him are rare. Rest in peace, Joe. Know that you made a great and positive difference in so very many lives. You were very much loved and respected, and you will be sorely missed. Fond memories of this great man who made a lasting impact on all he came into contact with as a teacher, coach, and friend. WAR EAGLE Coach Pico from the Westwood class of ’72. Farewell, Coach. I tried to employ my recently-transplanted New Jersey sarcasm to one-up you in Psyche and P.E., but you still bested this ’69 Westwood grad in a most fun way. Thanks for being such a great example. My years at Westwood High 66-69 we’re formidable. Coach Joe Pico certainly left his mark on my life. He was a terrific teacher. Uncle Joe you will be greatly missed. You have been a great blessing in my life. Terry and I love you. Coach, you did it. After the final buzzer of your last coaching games, you continued on and endured to the end. Thank you for your lifetime example my friend. You made life fun. We love you coach. He was a mans man. Such a powerful personality and presence. He was always so nice to everyone and always had that smile. I did say I was sorry that I drove over that concrete curb on my first day of drivers training in the Westwood front parking lot. Sure got a reaction from him on that (and the two other kids in the back seat). Saw him many times over the years (worked at MPS for 35 years as an Electrician). Alway so pleasant, and that big smile. Holding your family gently in my heart. I will cherish the memories I have of Uncle Joe and hope that memories of him are a comfort to all who knew him. Coach Pico was my favorite teacher back in the 70’s at Westwood. He always had time to talk with all of his students. He made everyone feel special. He was such a great teacher and coach. Coach Pico patiently demanded my best as he coached me in wrestling at Westwood. Thank you, Coach! The gentle giant has gone home to embrace loved ones on the other side. His smile will melt hearts there just as it has here. Endless lives have been blessed by his goodness and changed in positive ways. His legacy will continue in the lives of those he touched. I will always be grateful for the ways he has influenced me. Uncle Joe was a Man, who showed us how to treat ladies and Family with respect. The true definition of a man. Hey Grandpa, I can’t even begin to tell you how much I miss you. My Family and I will be there soon. Thank you for the example you were to me. You always got me to push my own limits. You made me a better man. You always led be example on how to always be there for my family and fellow man. I will strive to be the man you taught me to be and go on with my best foot forward. The values you instilled in me at a young age is why I am not afraid to work as hard as I do. This is a debt I’ll never be able to repay. You will always be in my heart. Thank you, Coach Pico. All my best, DC, Class of ’72. Coach Pico made a lasting impression on me and the importance of never giving up. He was a great man and example. We will see you on the other side Coach. You were a great example. We will see you on the other side. My condolences to your family. You are a dear friend COACH !!!! Safe passage, as you and I have always said I’ll see you there champ. I love you brother. Remember the time David Villaverde told him a rather risque joke at football practice. RIP Pico. I so enjoyed Coach Pico when I was a student at Westwood High School. I was, then, fortunate to also work with him as a coach at Westwood and Mountain View High School. My wife got to know Coach and work with him, too. Thoughts and prayers to all of the family. We will all miss him. My condolences go out to ball the family. My husband Coach Clyde Halcomb (passed in 2010) thought a lot of Coach Pico. My daughter Kerri also sends her condolences to the family. I know that all the coaches are having a great reunion in Heaven. Here is one for you Coach Pico “You Are/We’re Loved”! Thank you for being the best teacher I ever had and for caring about me at a time when it was most needed! God bless you! I only knew Coach because he use to come into my dry cleaners. My condolences to the Pico family. I owe a great amount of gratitude to coach Pico for helping me attain and grow professionally in my first full time teaching and coaching job at Gilbert High School over 30 years ago. I can remember as a 10 year old going to his youth football camps at Westwood High School in the mid 70’s and the impact coach Pico had on my youth football experience. Coach had a great way about relating to young people as a coach, teacher and later in school and district level administration. Teaming with coach Parker in building the great Mountain View football program from the start was one of the great coaching tandems in the history of Az High School football. Winning the state championship in the first year of big school competition, a feat that will probably be never done again. RIP in coach. I worked with Joe at Mt. View. One day, I was having a spiritual crisis and in my office walks Joe. Never having seen him in that part of the campus before, I knew he had been directed there by the Lord. We talked. He assured me all was well and, of course, it was. Thank you, Joe. I was rear-ended early one morning at Broadway and Val Vista. I looked in my rearview mirror at a grin from ear to ear… Big Joe…just happy to be up that early. Love ya and miss ya big fella, but will always remember ya. You’re the man. I was blessed to work with Joe during the start up of Mtn. View High School in the Social Studies Dept. and after I became Asst. Principal. Joe was always supportive of my role as SS Dept. Chair and as I fulfilled my job as the first woman high school administrator in the Mesa Public Schools. I will always remember the good times we had working together. One situation that I have shared with others and laughed about over the years occurred when Mtn. View and Mesa High were on double sessions. Our Social Studies Department was housed behind the Mesa High Social Studies Department offices. We were required to begin our day in the late morning which caused us to have an overlap with the Mesa High teachers. Joe became our lunch chef during that time using a hot plate to cook his delicious culinary creations. During one of our lunches, one of the Mesa High teachers walked through our area and remarked with disdain, “You’re like a bunch of gypsies!” Joe took the bait and the next day, along with his cooking, he strung all kinds of “laundry” on lines through our area and remarked that it was now true, we were a bunch of gypsies. Needless to say, after that the Mesa High teachers avoided coming through our area to get to their office. God certainly graced all of us with Joe Pico whether as a coach, teacher, or friend. Blessings to Joe’s family. I just learned of Joe’s passing. Our deepest condolences to Shirley and the Pico family.